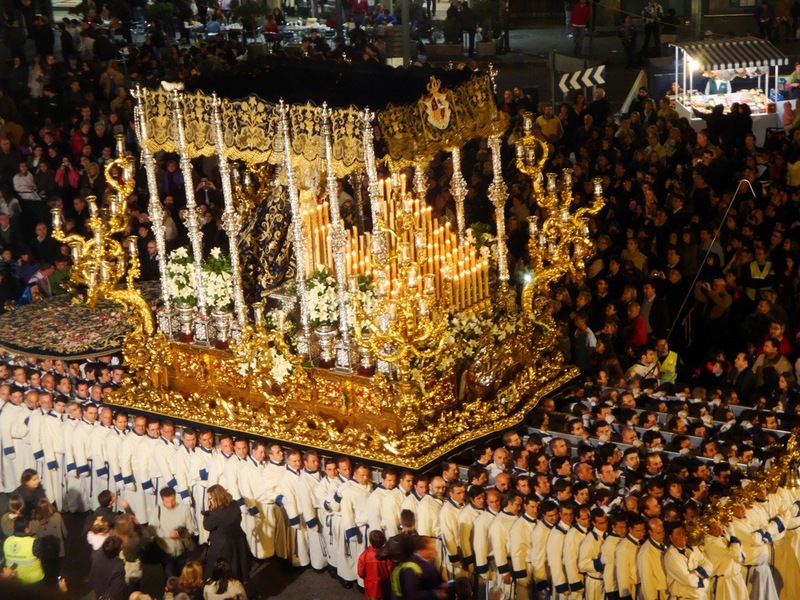 Monday Definitely “El Cautivo” – probably Malagueños favourite “Trono” – followed by thousands (seriously thousands!) of penitents (who follow it throughout the eight-hour journey – you will notice some are barefoot, some have shackled feet and some are blindfolded and led by friends. The cries of “Viva El Cautivo” all along the route are spine chilling. 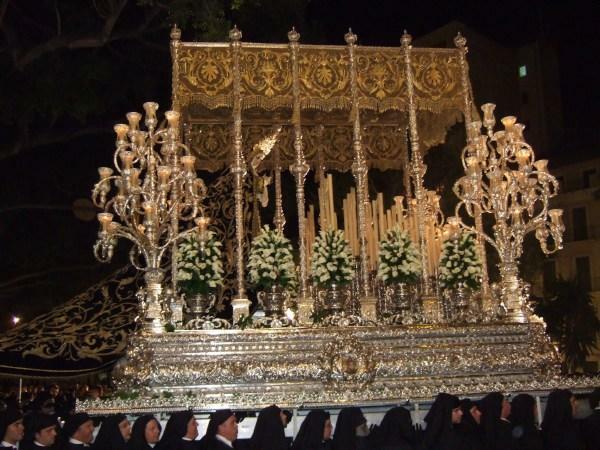 El Cautivo and Penitents. La Sentencia in Calle Larios. 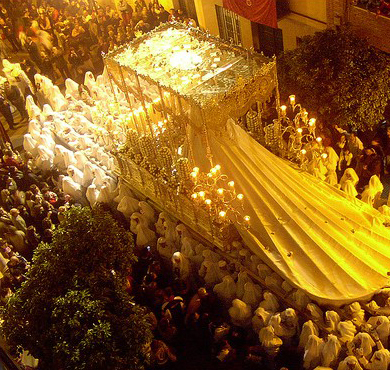 Wednesday The Virgin of the Paloma – one of the most magnificent (largest and heaviest) “tronos” in my opinion – carried by almost 400 men! 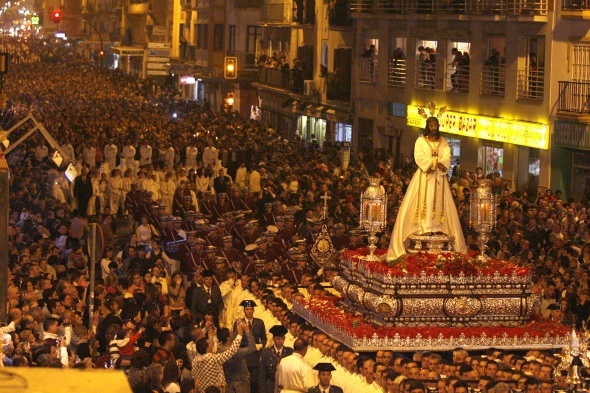 Thursday Is the day of The Foreign Legion – a truly amazing spectacle as they march along the route with the congregation of “La Mena” and their statue of The Virgin and Christ. 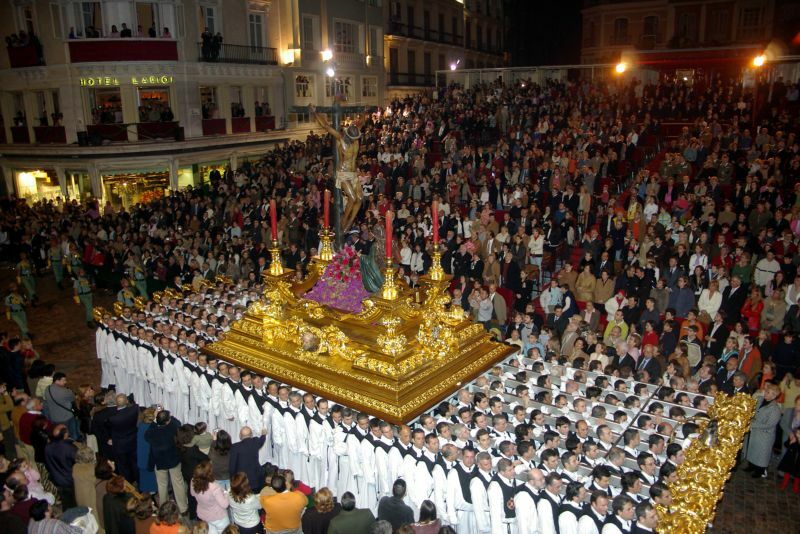 Video link to The Legionnaires parading the Statue of Christ before placing it on its “trono” ready for the processions. 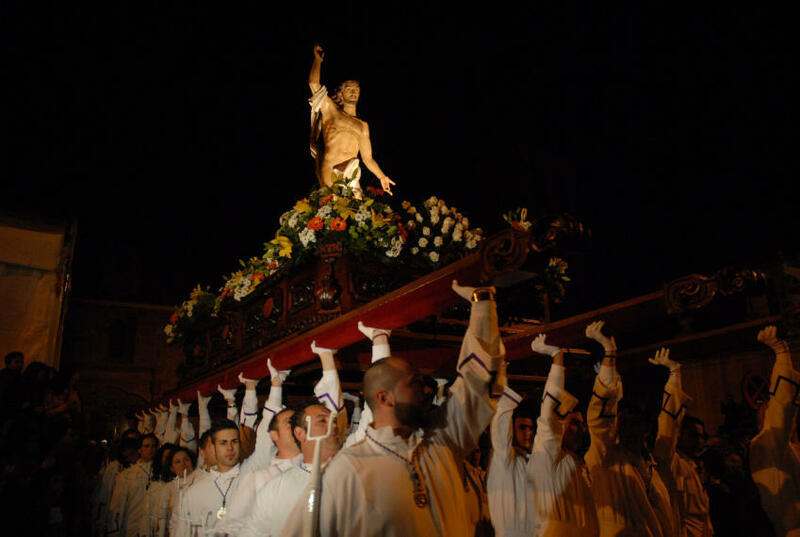 I feel sure that if you care to visit during the Semana Santa processions you will come away feeling equally “fulfilled” as you would have been if you had spent a couple of hours with Antonio! Now all we have to do is hope the weather plays its part!! (if not, you will still be able to visit all the tronos in their casas!). So looking forward to it! 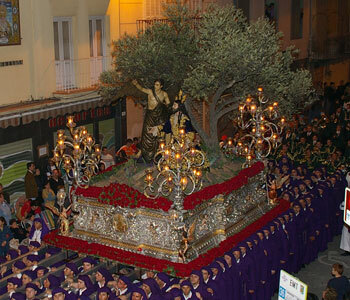 Thanks for love our Holy Week! 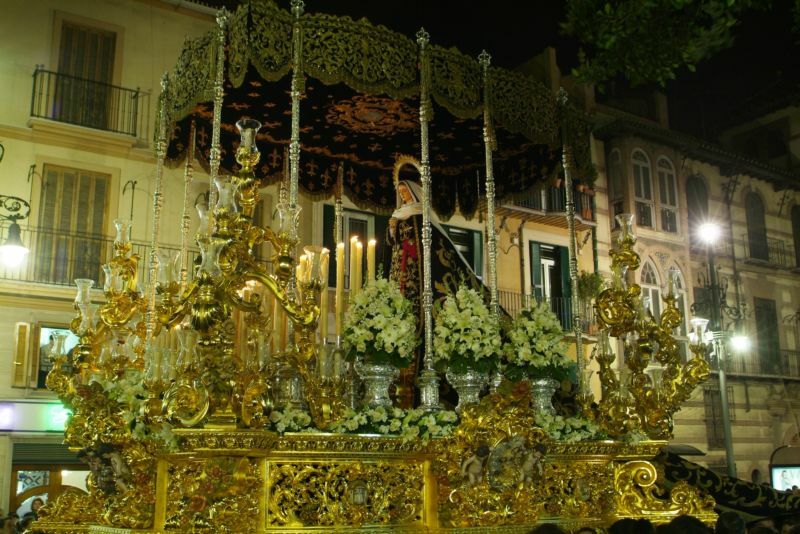 Virgen de la Esperanza (the largest “trono”and the most beautiful Virgin) y el Nazareno del Paso que da la bendición en la Plaza de la Constitución. I love “La Esperanza” too Victoria, but if I were to include them all it would be a very long post. Don’t worry – I will include her next year!! 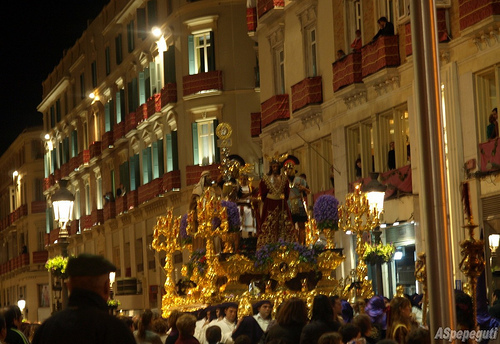 Easter sounds really good in Málaga! The truth is here in Barcelona it only really gets celebrated because of the large Andalusian population! I always feel it is one of the greatest “shows” in Spain Simon! 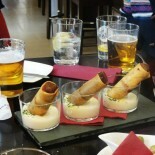 This entry was posted on March 22, 2013 by Tapas in Malaga in Málaga, Tapas and tagged Andlaucia;Spain;Holy Week, Calle Larios, Málaga, Room Mate Hotels, Semana Santa.